Will softball be the extracurricular sweet spot Katie is looking for? A sporty addition to a tween series that’s all about friendship—and cupcakes, of course! Katie’s Cupcake Club friends all have other activities besides making cupcakes: Mia and Alexis are on the soccer team, and Emma plays the flute. Katie sets out to find her extracurricular niche, and soon she’s dribbling, passing, and catching in an effort to find the right sport for her. Sure Katie can whip up a great cupcake, but can she cook on the field too? When Katie tries out and makes the softball team it’s batter up…but instead of swinging away she gets nervous during games. What if she makes a mistake? What if they lose? Is this the kind of batter Katie really wants to be dealing with? Katie starts to figure out that doing what you love always makes the batter sweeter. My name is Katie Brown, and I am crazy about cupcakes. I’m not kidding. I think about cupcakes every day. I even dream about them when I sleep. The other night I was dreaming that I was eating a giant cupcake, and when I woke up I was chewing on my pillow! Okay, now I am kidding. But I do dream about cupcakes, I swear. There must be a name for this condition. Cupcake-itis? That’s got to be it. I am stricken with cupcake-itis, and there isn’t any cure. My three best friends and I formed the Cupcake Club, and we bake cupcakes for parties and events and things, and sell them. We’re all different in our own way. Mia has long black hair and loves fashion. Emma has blond hair and blue eyes and lots of brothers. Alexis has wavy red hair and loves math. I have light brown hair, and I mostly wear jeans and T-shirts. I’m an only child. And I hate math. But I have one big thing in common with all my friends: We love cupcakes. That’s why we were in my kitchen on a Tuesday afternoon, baking cupcakes on a beautiful spring day. We were having an official meeting to discuss our next big job: baking a cupcake cake for my grandma Carole’s seventy-fifth birthday bash. But while we were thinking about that, we were also trying to perfect a new chocolate-coconut-almond cupcake, specially created for my friend Mia’s stepdad and based on his favorite candy bar. We had tried two different combinations already: a chocolate cupcake with coconut frosting and almonds on top and then a coconut cupcake with chocolate-almond frosting, but none of them matched the taste of the candy bar enough. Now we were working on a third batch: a chocolate-almond cupcake with coconut frosting and lots of shredded coconut on top. I carefully poured a teaspoon of almond extract into the batter. “Mmm, smells almondy,” I said. “Hey, my grandma Carole’s an old lady, and she doesn’t have ugly wallpaper in her house,” I protested. Emma picked up the ice-cream scoop and started scooping up the batter and putting it into the cupcake pans. “Right!” Alexis agreed. She flipped open her notebook and took out the pen that was tucked behind her ear. Sometimes I think Alexis must have a secret stash of notebooks in her house somewhere. I’ve never seen her without one. My mom appeared in the kitchen doorway. “Katie, you know how I feel about yelling,” she said. “Sorry, Mom,” I said in my best apology voice. “I was thinking more like a bunch of cupcakes arranged in tiers to look like a cake,” Mom replied. “Sure,” Alexis replied, handing them to her. Mia began to sketch. She’s a great artist and wants to be a fashion designer someday. “Like this?” Mia asked, showing Mom the drawing. I looked over Mia’s shoulder and saw the plan: three round tiers, one on top of the other, with cupcakes on each. “What do you think, Mom?” I asked. “All done!” Emma announced, putting down the ice-cream scoop. “Mom, oven, please?” I asked. “Sure thing,” Mom said, slipping on an oven mitt. She put the chocolate-almond cupcakes into the preheated oven, and I set the cupcake-shaped timer on the counter for twenty minutes. Mom left the kitchen, and the four of us sat down at the kitchen table to work out the details. “So what kind of flavors does your grandmother like?” Alexis asked. “So we can make blueberry-chocolate-maple cupcakes with walnuts on top!” Mia joked. “Hey, we thought bacon flavor was weird and that worked out well!” said Emma. It was true. Bacon flavor was a really big seller for us. I went into the den where Mom and I keep all our books and picked up a photo album. We have lots of them, and there were pictures of Grandma Carole in almost all of them. I turned to a photo of me and my mom with Grandma Carole and Grandpa Chuck at Christmas. Grandma Carole looked nice in a red sweater and the beaded necklace I made her as a present at camp. Her hair used to be brown like mine, but now it’s white. “Just like my mom!” Emma said, smiling. I flipped the pages in the photo album and found a picture of Grandma Carole in her white tennis outfit, holding her racquet. “Do sports have a flavor?” Mia mused. “Um, sports-drink-flavored cupcakes?” Alexis offered. “Or sweat-flavored cupcakes,” I said, then burst out giggling. “Or smelly sneaker-flavored cupcakes,” Mia said, laughing. “Ew, sweat and sneakers … those are so gross!” Emma squealed. “But I guess she does like sports most of all,” I said. “She’s always trying to get me to do stuff with her. Because I am soooo good at sports.” I said that really sarcastically, because the exact opposite is true. Now it was Emma’s turn to giggle. “Yeah, I’ve seen you in gym,” she said. “Oh, that’s terrible!” Emma cried. Mia put a hand to her mouth to try to stop from laughing. “Oh, Katie, that would be funny if it weren’t so terrible!” she said. “So I guess you don’t take after your grandmother,” Alexis said. “I just did,” I said. “Yes, the pressure is on,” Mia agreed. We tried for the next few minutes, but nobody could think of anything. Then Emma looked at her watch. “Let’s do it tomorrow,” I suggested. But Alexis and Mia had whipped out their smartphones, and Emma took out a little notebook with flowers on it—and they were all frowning. “Alexis and I have soccer practice tomorrow and Thursday, and a game on Friday,” Mia reported. “And I have concert band practice on Wednesdays and Fridays,” Emma said. Emma plays the flute, and she’s really good at that. “Sorry, Katie. You know spring is a busy time of year,” Alexis said. “Yeah, sure,” I said, but really, I didn’t. I don’t really do anything besides the Cupcake Club, and it’s not just because I have cupcake-itis. I’m no good at sports, and I’m not so great at music, either. When we learned how to play the recorder in fourth grade, I ended up making a sound like a beached whale. My teacher made me practice after school, after everyone went home. Just then the cake timer rang. I put on a mitt and opened the oven door. All the cupcakes in the pan were flat. They should have gotten nice and puffy as they cooked. Mom rushed in a few seconds later. “Katie, what did I tell you about—Oh,” she said, looking at the deflated cupcakes. “It’s not your fault,” Emma said. “Whenever that is,” I mumbled. Emma, Alexis, and Mia started picking up their things. Emma saluted. “Yes, General Alexis!” she teased. “Ooh, if Alexis is the general, can I be the cupcake captain?” I asked, and everyone laughed. When my friends left, the kitchen was pretty quiet. Mom went into the den to do some paperwork, and all that was left was me and a pan of flat cupcakes. As I cleaned up the mess, I thought of Alexis and Mia and Emma all going off and doing stuff—stuff that I couldn’t do. They were all multitalented, and the only thing I was good at was making cupcakes. It made me feel a little bit lonely and a little bit like a loser. In fact, it made me feel as flat as those cupcakes. 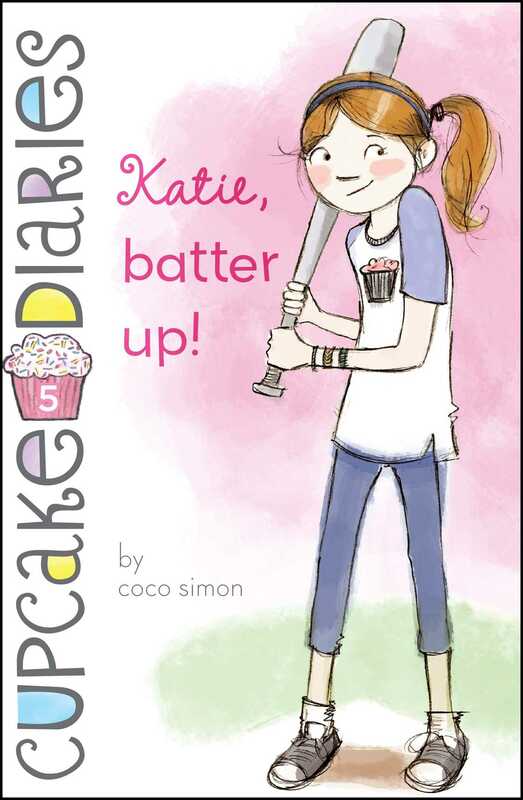 Book Cover Image (jpg): Katie, Batter Up!